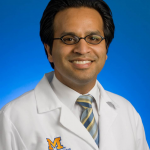 Sameer D. Saini, MD, MS, is an assistant professor in the Division of Gastroenterology at the University of Michigan Medical School and a research scientist at the VA Ann Arbor HSR&D Center for Clinical Management Research. He is also Associate Director of the GI Epidemiology Training Program at the University of Michigan. Dr. Saini has a long-standing interest in appropriate use of costly and potentially risky medical procedures, such as colonoscopy and upper endoscopy. He also has extensive experience in simulation modeling and health economic analysis. His current work includes the development of quality measures for colonoscopy and colorectal cancer screening. He is also Principal Investigator on a VA-funded study that will develop more patient-centered, individualized approaches to cancer screening, including the development of patient-centered quality measures.